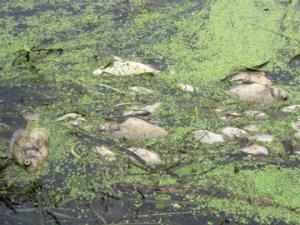 On July 20, 2013, hundreds, if not thousands, of dead fish were found floating in the Ben Smith impoundment on the Assabet River in Stow. An OARS team of volunteers, out to remove water chestnut plants, discovered the large numbers of dead fish in the slow-moving section of the river between Rte 62 and Sudbury Road in Stow. OARS team leader, Allan Fierce, photographed the scene and reported the problem to the State (see below for how to report fish kills). According to MassWildlife the hot weather last week, with temperatures hitting 100°F on July 19th, is the likely cause of the fish kill. Where the river is shallow and slow-moving, afternoon water temperatures can reach lethal conditions (93°F is lethal for almost all species of fish). If fish have no deep or shaded places to retreat from the heat (“thermal refugia” in scientific terms), fish kills like this occur. On July 22nd , after two days of much cooler weather, OARS measured afternoon water temperatures still over 86°F and dissolved oxygen concentrations over 200% in the area downstream of the fish kill. This destruction of fish graphically illustrates that the Assabet River is not yet a healthy river and does not have the resiliency needed to protect us and local wildlife from the effects of a changing climate. Please report to OARS (978-369-3956 or email), and MassWildlife. Between the 1st week of April through the 1st week of October, fish kills can be reported via the MassWildlife's Fish Kill Response phone at (508) 450-5869. You can report a fish kills year-round Monday-Friday (8 am -4:30 pm) to Richard Hartley at (508) 389-6330. After normal business hours or on holidays and weekends, contact the Environmental Police Radio Room at (800) 632-8075. More information at MassWildife’s “When You Find A Fish Kill”. Photos courtesy of Allan Fierce and Julia Kindlon.